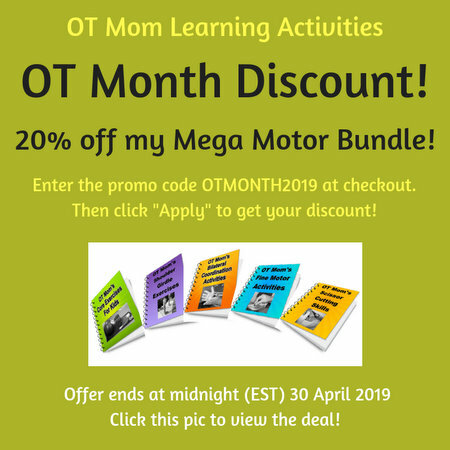 This is a site that I have written for parents and teachers, from my experience as a pediatric OT who is now a homeschooling mom. However, I am just not able to give specific advice online without seeing your child, which is obviously impossible for me to do. If you are concerned about your child's development, please try and get a referral to a health professional who can help you more professionally than I can online. So I regret that I am probably not going to answer specific queries regarding your child with in-depth replies! I have attempted to answer questions in the past and am undertaking to build new pages and a FAQ database based on the answers I have written to various dilemmas described in the emails. This is taking some time, but will hopefully help more children and families in the long run. You can search my site to see if any of my current pages may help you. Just type in your keywords in the box below and click on "search this site". If you sign up for my newsletter then you will be notified as the new pages get posted. If you are having trouble with your e-books downloads, or have another e-book related question, check out the E-Book FAQ page to see if your question is answered there. And of course, if you just want to say "Hi", by all means fill in the form! Thanks for popping by! We will try to get back to you within a few days but trust you will understand if offline life prevents a quick response. Many blessings as you strive to help the children in your life! Write your comment or query here. I understand that you will use this information to respond to my query and/or comment.